Even the best prospects make mistakes. Sometimes it's the type of mistakes they make that elevate them from the pack. Photo by Michael Li. Note: The posts of 2012 Draft Prospects this month are brief examples of plays that highlight specific skills and/or deficiencies of a player. They are not meant to draw overall conclusions of that player’s pro potential. For a thorough analysis of these prospects – and over 150 others – purchase the 2012 Rookie Scouting Portfolio, available through a link at this site on April, 1. Yesterday, I featured a play where Robert Griffin III reacts poorly to pressure. Today, Andrew Luck gets the same treatment. However, I believe there’s a difference between the types of mistakes that I showed with Griffin and the two I’ll show today with Luck. Griffin’s opponent tipped its hand before the snap and the Baylor quarterback missed a relatively easy read. In contrast, Luck’s opponent uses a more complex scheme and hides it before the snap like a stone-faced killer. Luck still makes mistakes, but the errors are against a more advanced concept with stronger execution. With 7:00 in the first quarter, Luck and the Cardinals come to the line on 1st and 10 in a 1×3 receiver, 10-personnel shotgun set versus Oregon’s 3-3-5. Can you guess who is blitzing? 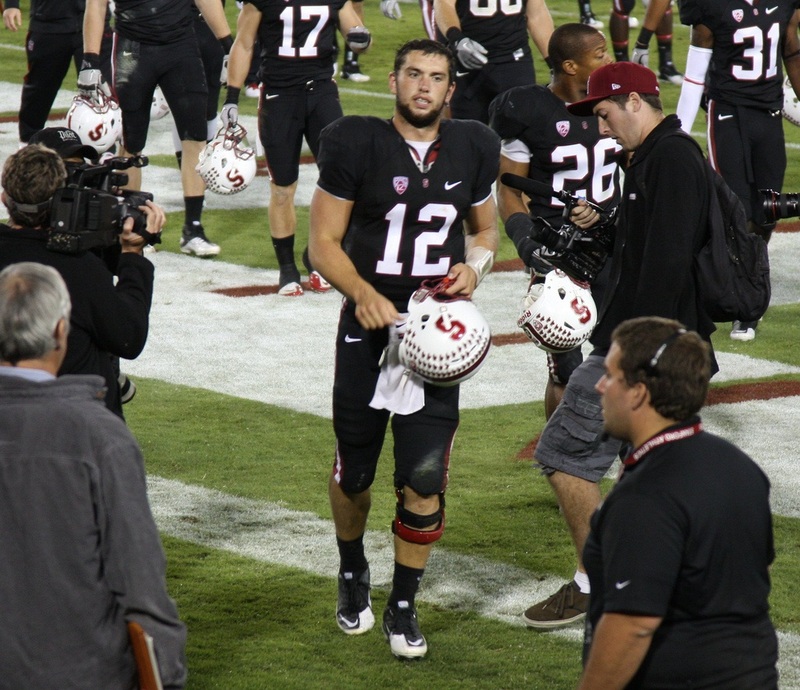 As ahead of the curve Luck is at the position for a college quarterback, he couldn't. On this play, Oregon’s 3-3-5 defense has a slot DB on the near side slot receiver, the outside corners in man coverage on the flanker and split end, and the strong side linebacker over the tight end who is in a two-point stance at the line. What a quarterback should be gauging before the snap is whether one of the safeties creeps towards the line. If the free safety cheats towards the line, there’s a possibility that the the weak side linebacker or middle linebacker is planning to blitz. Since the weak side linebacker is at the line already, any forward movement from the free safety would be one of the primary things the quarterback should be watching. Another possibility to watch is the strong safety. If he moves towards the line before the snap, this could indicate the slot defensive back is blitzing from the near side of the field and that gives the strong safety responsibility for the middle receiver on the trips side. A third possibility is that the strong side linebacker blitzes and the middle linebacker slides to that side to cover the tight end in the slot. Unfortunately, the television broadcast does not maintain this All-22 shot throughout the play and we don’t see if one of the safeties move forward. However it is pretty clear that the strong safety doesn’t move at all. Even as the camera angle tightens it only narrows a modest amount, and the strong safety would only need to cheat forward a yard to get into the frame. He doesn’t. This is an excellent blitz because the safeties don't tip off a thing for Luck to see before the snap. Even the SLB and slot DB aren't tipping off a blitz from the edge. 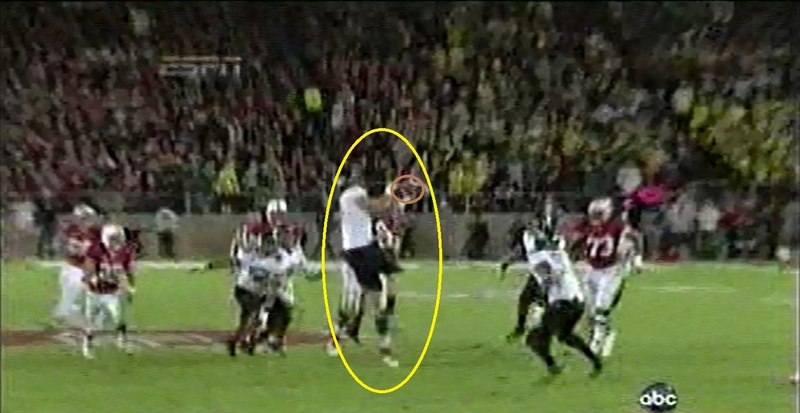 This lack of movement is great discipline from the Oregon defense. There are no obvious tells for Luck to read from this vantage point. When the Stanford QB calls for the ball, it’s clear he doesn’t even realize the blitz is coming from the strong side until late in the play. Luck immediately looks to the single receiver on the far side because the only discernible blitz read Oregon shows is the weak side linebacker and the second-level defender drops into the zone to foil the slant. The fact that Luck reads the weak side linebacker as the blitzing defender before the snap gives Oregon’s defense a huge advantage. Not just because Luck thought he was going to throw into the blitz, but discovers the linebacker is covering his hot route, but the Stanford offensive line adjusted its pass protection to the wrong side. Now the Cardinals running back is the only protection off the strong side edge with two Ducks defenders screaming through. By the time Luck turns to the other side of the field, he’s in the weeds. If Luck began the play throwing into the correct blitz side, the safety is too deep to defend a hot route. However, the WLB led Luck astray and now he's looking down the barrel. Although the running back picks up the strong side linebacker, Luck still has the unblocked defensive back streaking from the slot and as a bonus, the strong side defensive end crosses the face of the left tackle and gets pressure up the middle. At this point, Luck neither has the open space to hit the tight end near the 50 nor the room to step into a pass directed at the other two trips receivers down field. He has three options: run, take the sack, or throw the ball away. Luck chooses to throw the ball at the feet of his RB. Quick thinking, but that's not how it works out. Instead of getting the ball off, Luck gets the crown of the slot defensive back’s helmet to his chin and the ball flies skywards. Somewhere Jene Bramel is smiling and doesn't know why until he takes a break and sees this defensive back laying the smack down on a quarterback the caliber of Andrew Luck. If not for a great play by his offensive lineman to knocked the ball loose from the defensive tackle’s grasp, this is an interception. Kirk Herbstreit described Luck's actions prior to the hit as a "pump fake" and a "pass attempt." Understandable in the heat of the moment, but in hindsight he was too kind. Luck hesitates due to pressure and then almost pays for it with an interception. Two plays later, Luck and the Cardinals come to the line in a 2×2 receiver, 10-personnel shotgun set on 3rd and 9 with 6:00 in the first quarter. Alignment of defense before Luck sends the TE in motion. Luck motions the tight end across the line and back to get a look at the strong safety, who moves towards the line a few steps. The strong side corner linebacker shifts from the line in a blitz look to a coverage look on the far side receiver, but still shows blitz with his stance slanting inside as the corner drops to safety depth. At this point, it’s easy for the quarterback to still think this is a blitz off the strong side with the possibility of more coming from the other side of the line. The strong side blitz is accounted for and he’s also expecting the DE in a two-point stance to come from the weak side. Luck is likely thinking this is a five- or six-man blitz with six or seven in coverage. Either way, Luck is thinking there’s going to be an open receiver on the weak side (left) of the field. However, Oregon may look like it’s blitzing 5-6 men, but this is a zone blitz concept that blitzes three and drops eight. The ingenious thing about fire zone blitzes is that the defense often comes at the offense with fewer players than expected but at unexpected directions that foil the pass protection scheme. The defensive end in the two-point stance drops deep as do the two strong side defenders at the line to get into a tight zone around the tight end on the wing. When Luck takes the snap, he’s immediately looking to the weak side. Luck is suckered into looking to the side where coverage is strongest. By the time he progresses to the opposite side of the field, the blitz off the strong side edge should collapse the pocket. That's the defense's intent. As Luck begins his drop he looks to the right and sees the tight end working up the seam with a linebacker dropping in zone. He turns his head to the left just as the tight end delivers a shot to the linebacker off balance. When Luck doesn’t seeing anything to that weak side, his internal clock warns him that pressure is getting close. Luck turns away from the weak side to see the pressure around right end and his tight end against zone coverage in the right flat. What happens next is an indication that Luck either forgot that two defenders dropped into the zone around the tight end or he never saw it. I think it’s likely that Luck never saw it. When the quarterback slides away from the pressure and delivers the ball to the right flat, the linebacker jumps the route for the interception. When Luck faces 3-4 defenses that employ fire zone looks in the NFL he's going to have vivid memories thanks to Oregon and a few others teams that initiated him. The defender turns up the left sideline, nearly scoring if not for Luck tackling him at the Stanford 20. These aren’t easy defenses to read but they are the types of schemes Luck – and the rest of this rookie class – will have to face in the NFL. What will determine Luck’s success against complex defenses isn’t whether or not he’s fooled – because he’ll get fooled time and time again in the NFL – but whether he can stay mentally and emotionally in the game and not make careless mistakes against more vanilla schemes after some of these tougher plays trip him up.